Rising Star Games have at last brought the latest instalment in the Rune Factory series to European shores, providing the perfect excuse for role-playing fans and farming aficionado’s to while away the hours on their Nintendo DS. 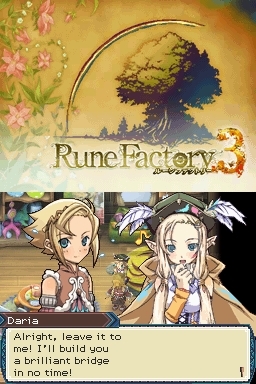 Rune Factory 3, as this latest game is aptly titled, follows a similar storyline set-up as seen in previous entries within the series, where a young boy, Micah, falls into the care of a nearby village only to wake the next day to find himself suffering from amnesia. Making the villagers aware of his predicament, Micah is then allowed to take up residence within the Sharance Tree until his memories return, and is tasked with taking care of the farmland that surrounds the tree’s roots. Though Micah soon discovers that he hides a secret: that he is a half-monster and is able to freely transform between either a human or ‘Wooly’ (a two-legged sheep-like monster). This allows him to come into contact with a nearby Univir settlement located within the desert, where he learnt that the horned Univir once lived amongst the humans in Sharance Village but were exiled due to a disagreement. Micah soon realises that he must utilise his unique ability to rebuild the trust between the Univir and humans, to allow them to once again live peacefully alongside one another. What follows is a familiar formula. Much of your early hours with Rune Factory 3 will see you performing basic tasks that allow you to get yourself acquainted with the game; growing crops that are then able to be sold for profit, fishing, gathering materials and partaking in village festivals. 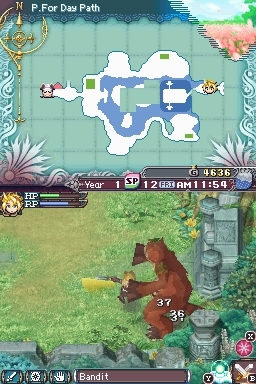 These are then uniquely blended together with role-playing elements that have allowed the series to differentiate itself from its Harvest Moon counterpart. Festivals themselves are optional, with the player able to choose whether to involve themselves within them or to completely ignore them and continue to do whichever daily tasks that you prefer. Opting to check them out though can provide a number of humorous moments, a personal favourite being a festival in which the player is required to repeatedly attack a giant Wooly with a large fish in order to remove the wool from it. Fun, if not a little bizarre! Everything you do, whether it be trivial activities such as walking or sleeping to more significant elements such as combat or farming, allows you to continually gain experience to become more proficient with such specific skills. Doing so then ultimately allows you to raise the overall level of your character, strengthening their core attributes and allowing you to tackle the more challenging dungeons that surround the village. The dungeons, which encompass Privera Forest, Sol Terrano Desert, Oddward Valley and Vale River, not only provide a further opportunity to level your character by defeating increasingly difficult foes, but also allow you to secure more valuable herbs and materials as well as weaponry and tools. You’ll also intermittently face boss battles although these won’t pose a significant challenge to those that soon discover that the usual RPG fare of attack, dodge, repeat works a treat, all the while healing where necessary. The Sharance Treehouse in which you reside remains an invaluable resource throughout the entirety of the game, initially providing fundamental mechanics such as a bed to rest in, a calendar to keep notified of upcoming festivals, and item storage. However, through story progression, you are soon granted the opportunity for expansion, allowing you to construct, for example, a Forge, Workshop and Barn for your sole use to delve into crafting or to befriend monsters. Whilst the mere mention of befriending monsters may immediately bring the likes of Pokémon to mind, within Rune Factory 3 such a concept serves an entirely different purpose. The player is able to use food to tame and then befriend any creature that is a significantly lower level than your character. You must then continue to do so in order to build more trust with the monster with the reward being that they will then be able to follow you and may also live in your Barn, once constructed, at the Sharance Tree. Then, depending on the species, they are able to help you out in a multitude of ways: assigned to weeding, watering or harvesting your farm, or even able to form a party alongside you to make higher level dungeons easier for you to beat. 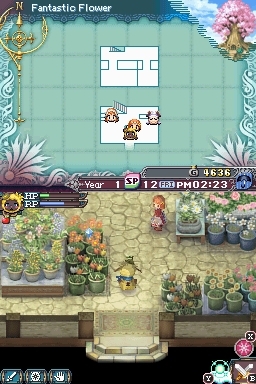 It is also worth noting Rune Factory 3’s beautiful art direction – brimming with personality and character at every turn through the use of detailed, hand-drawn manga artwork that is fused with particularly colourful landscapes. This is in turn accompanied by a jovial soundtrack that suitably helps capture the nature of the game. Multiplayer has also been incorporated into the game in the form of the Labyrinth World, in which you can either team up with two other players or try to tackle it by yourself. Dungeons within the world are randomly generated, with items and experience gathered within them carried across into your single-player game. A similarly pleasing inclusion is that of online rankings, in which you are able to view your accomplishments and how they compare to other Rune Factory 3 players. It’ll surely motivate competitive players into improving their farms, or even aiming to better their scores on the title’s minigames. Rune Factory 3 successfully builds upon an already established formula, not only proving that the series is capable of expanding in innovative methods but also in continuing to perfect previous design. It certainly amounts to one of the deepest and enjoyable releases on Nintendo DS this year.